I never even got the reel in gear before the telltale jerking and shaking signaled a red snapper connection. Actually, I suspect the crimson beast had grabbed my jig on the descent. As line peels off a spinning reel, the spool’s orientation releases each loop in a symmetrical surge. However, when my line jumped noticeably about 30 feet from the bottom, I raised the suspicious eyebrow. That suspicion turned to glee when I reeled my Tsunami Knife Jig to the surface and found it heavy with a thrashing red snapper ensnared by the dangling hook. 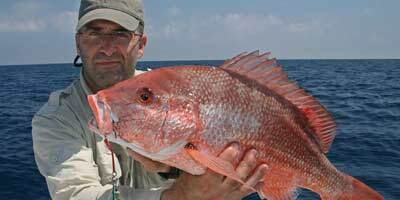 Ruby scaled and bursting with aggression, American Red Snapper swarm hard bottom structure throughout the Gulf of Mexico and anglers recently received good news from the National Marine Fisheries Service (NOAA Fisheries) – red snapper season has been extended. On June 29, NMFS announced that the closure date for the Gulf's recreational red snapper season has been moved back six days. Initially set for June 1- July 10, the season now closes at 12:01 a.m. local time, July 17, 2012. The last day for recreational harvest will be July 16. Currently listed as an overfished species by NMFS, Gulf red snapper are under a rebuilding plan intended to return the population to sustainable levels by 2032. According to agency data, a substantial portion of recreational red snapper harvest in the Gulf of Mexico comes from the north-central Gulf of Mexico. During June, this region saw an extended period of severe weather – mostly caused by Tropical Storm Debby – so recreational landings were less than projected. Upon determining that the recreational harvest quota was not likely to be met by July 10, NMFS moved to extend the season. This is great news for Gulf anglers frustrated with an already brief recreational harvest season cut short by meteorological mayhem. The extension gives fishermen throughout the Gulf a wider window of opportunity to bag the delicious and sporty fish. Running out of Venice, La., Capt. Damon McKnight finds his most consistent action around the oil rigs dotting the Mississippi Delta region. He typically runs out of Tiger Pass or South Pass, but he'll plan his destinations based on wind conditions and current. Good water flow always stimulates predators, but too much current makes it hard to reach deep fish. Elsewhere, red snapper abound over the Gulf's natural and artificial reefs, wrecks and the exposed portions of the Gulfstream Natural Gas Pipeline (reaching from Alabama coast into Florida's Tampa Bay). As Wagner notes, locating a good area and then moving around within the area keeps the action rolling without depleting any one number. “The snapper will move, so if you’re sitting on a school and they take off, you have to go look for them and find them again,” Wagner said. “The key is to not just go ‘number fishing'. Go look around (a main spot). The red snapper usually show higher in the water column than a grouper. Dead sardines, Boston mackerel or menhaden (pogies) will bring plenty of snapper to the boat, but for maximum fun, try jigging your crimson quarry. Most common are the shiny, slender metal jigs with one or two dangling assist hooks. McKnight uses Shimano Butterfly jigs and Williamson Abyss jigs but others like the Lamble Baits Flashing Haoli jigs and the venerable diamond jig also produce. Tsunami's uniquely designed Facet Jig also fits the red snapper pursuit. A broad, angled head comes with light-catching 3-D eyes a scaled or glow finish and a swivel-rigged hook. The body trails a glowing silicone skirt that grabs attention in low-light conditions. Shimano's Lucanus jig also features a large, aquadynamic head and adds twin dangling hooks, a silicone skirt and silicone trailers. With any jig, McKnight warns that bigger is not necessarily better. "The size I use is 6-ounce to 12-ounce. I don't like using too big of a jig because (red snapper) don't seem to like the bigger jigs. Something in the 6- to 8-ounce size usually does the best. "Every now and then, you'll hit a school that will take the big jigs and then it just doesn't matter what you fish. But most of the time, if you want to get a bite from a red snapper, you can't use one of those 12-inch, 16-ounce jigs. They just don't seem to take them." For simplicity, a medium-heavy to heavy-action spinning outfit will handle jigging duties, although there's nothing wrong with using those conventional outfits, if that's what you have onboard. Jigging aficionados, however, will appreciate task-specific rods optimally balanced with lure-dancing flexibility and fish-whipping backbone. McKnight uses the 6-foot Shimano Trevalla 2X Heavy rod with a Shimano Talica 16 reel. He loads his reel with 130-pound Jerry Brown Spectra braid and top shots it with several yards of 80-pound monofilament. This arrangement offers the best of both worlds, as the braid cuts through the water for faster drops, while the mono provides the stretch necessary for consistent hookups and minimal line wear. When snapper bunch into tight groups, they'll bite just about anything that crosses their radar, but a bait with no DNA usually requires plenty of action to make the sale. Modern jigs are smartly finished with light-bouncing angles and subtle accents of color intended to mimic natural forage. Even with such artistic appeal, you'll need some snappy rod work to seal the deal. "The most important thing is making sure you're getting the jig down to where the fish are," McKnight said. "Most of the time you want it to be straight below you. You don't want it to be upcurrent; you don't want it to be to the side. It's most important to get it straight down because if you're working that jig from an angle it just doesn’t seem to be as productive so you want to jig it straight up to you." McKnight describes the best action as "jig up and reel, jig up and reel." Simply raising and lowering the rod cuts short you jig's potential. Dance the lure while gathering line carries the show throughout the water column. The exception, of course, is when you locate that sweet spot through which nothing goes untouched. "If you're in a spot where you know the fish are really thick, you might be able to get away without reeling any line back onto the reel," McKnight said. "Mainly, you just want to take one good jig where the action makes (the lure) flutter, take up some line so you don’t have any slack and then drop it back down to that spot." McKnight said that the first minute of a snapper fight – especially with one of the bruiser sows – is critical. Break the fish's hopes of reaching whatever entanglement it wants to use and they'll usually walk right up the water column. As far as keeping as keeping a hooked snapper buttoned up, steady pressure and a deeply bent rod will ensure a successful capture. For red snapper fishing trips, contact Capt. Ryan Wagner at (727) 410-0021 or Capt. Damon McKnight at (985) 960-1900.